Blued steel, 30-round, .223 Rem. caliber magazine for Mini-14®. 30-round magazines are not available in all states and locales. Ruger cannot bill to or ship 30-round magazines to the following states and cities: California, Colorado, Connecticut, Hawaii, Maryland, Massachusetts, New Jersey, New York, Vermont, Washington, DC. ILLINOIS Restrictions: Aurora, Cicero, Skokie, Chicago, North Chicago, Chicago Heights, Cook County, Buffalo Grove, Dolton, Hazel Crest, Highland Park, Homewood, Melrose Park, Oak Park, Evanston, and Franklin Park. If you live in any of these locations, DO NOT ORDER THIS MAGAZINE. I have 2 stainless 30 round mags for my mini 14.they look perfect despite over 20 years.good mags are worth the money. Bite the bullet you will be glad down the road.plus the mini is stainless. I have a 38 yr. old series 181 Mini-14 and nothing but real Ruger mags will run reliably in it. Ive tried aftermarkets and should have saved my money. Stick with the real thing, youll be much happier, even if you are a little poorer because of the price. I am very disappointed with this item. It wont take more than 16 rounds, and then it binds. I have other ruger mags,5,10,20 rounds that work great. Ill stick with them. Wont hold bolt open after last shot or with empty magazine. Very unsatisfied! Bought two of these thinking they would be better quality than my aftermarket clips. Both of them wont hold the bolt open after the last shot or with an empty magazine in place. My original 5 rounder and all the after market clips hold the bolt open like intended. Whats the point of paying extra money for these if they dont function! Not sure if I will buy Ruger products the future! I learned my lesson with cheap aftermarket magazines. Tried several aftermarket magazines in my Ruger Mini-14 with very disappointing results, but have never had a malfunction with factory magazines. Yes, they are expensive, but they are dependable, and thats important to me. Ive gotten rid of all my aftermarket mags and now use only factory mags. I have a number of the 30 round, 20 round, and 10 round mags for my Mini-14 223/5.56 Have never had a failure in feeding. Will these mags also work ion the Ruger Gunsight Scout Rifle Model 6824? Im thinking of buying one in 5.56 Nato/223 rem and would like to be able to interchange mags. Overall the construction of these magazines is good, but I notice when I get down to the last 2 to 4 rounds in the magazine the rifle will jam from time to time. I notice that the followers tend to tilt down when the rifle is chambering another round causing an occasional jam. It would be a real good move for Ruger to developed an anti tilt type follower similar to those found in the ar-15 magazine platform to alleviate this issue. I have a supply of 20 round Ruger mags. Several years ago, due to price I purchased a 30 round after-market magazine for my Mini. First trip to the range with the new mag was a disaster. I threw it in the garbage, went home and ordered the Ruger 30 round magazine. Ive since purchased several more. Why just 4 stars? Simple, price. Theres no reason for these magazines to cost so much, but again, they do work. I live in Florida where it is always humid. I store my magazines in surplus military ammo cans with a dessicant pack in each can. You might want to try this to keep them from rusting when not in use. I just had to share that this mag is the best I have ever used! Ive been using these for about six years now and no hang ups yet. I have 17 of these, and they digest EVERYTHING, just like the mini its self!!! Unlike my ARs that I love, these I keep loaded for home invaders, they are much more trustworthy mags!!! Make these stainless! That would make this an amazing magazine, instead of just a good one. keep the black magazines in your gun safe and the wont rust thats what I do. but if you put them up wet they will rust need I say more. and you can buy magazines at your local gun shop for less money and they are made by RUGER. I too really need a good stainless version of this! The blued steel is normal but if you store them in the damp -use on the real ranch- the mags rust and have to be replaced all the time. I have tried multiple aftermarket 30rd stainless and have numerous reliability problems. I live in MN and stainless is a must. Please start offering these in stainless. 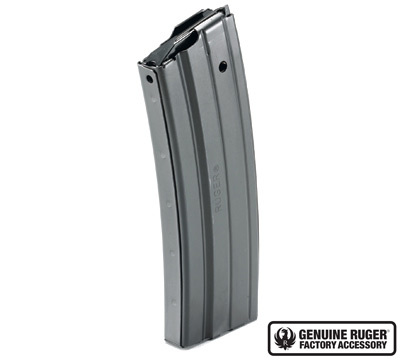 Ordered a few of these, the factory ruger mags are the only ones that work without any issues, I just wish they werent so expensive, but they are great quality! these 30 round clips are very good. but I have found a place where I can buy them for a lot less money so I bought two more of them.